The SPACE market is located in the Seaview subdivision in lower Puna. The Seaview Performing Arts Center for Education (SPACE) is the creation of the Hawai’i Volcano Circus (HVC) where a variety of successful art programs were established. SPACE serves as a hub for many creative endeavors and also has been hosting the farmers market for the last three years. Since then, this colorful market has been attracting between 30 to 50 vendors, depending on the time of year and over 300 patrons every Saturday morning. 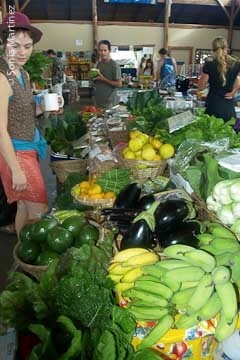 The SPACE farmers market is located off Highway 137 (Red Road) in lower Puna at the Seaview Performing Art Center for Education, from which it takes the name as an acronym. Once you turn into the Seaview subdivision, the signs are not very obvious and I had to ask someone how to find it. At least 6 vendors were serving ready-to-eat foods from pastries to elaborate egg dishes, several prepared right while you watch. Separate from the main area but right beside it were several canopies sheltering over 10 picnic tables where I noticed patrons, several of them tourists, eating their fare the whole time of my visit. Of course, I did too. Music, lots of conversation and a visual kaleidoscope of colorful fruits and veggies all vie to compete for your attention. In addition, SPACE hosts a swap meet on the 2nd Saturday of every month and lets anyone set up on the grounds around the Art Center. The mission of this market is to promote sustainability by only supporting vendors who sell locally grown or raised products; and to being a vital part of the local economy by providing a safe, village-based marketplace for the community to buy and sell goods and services produced on Hawai’i Island. Matt and Noelle Purvis of Tin Shack Bakery have been selling homemade organic breads, scones, muffins, English muffins, bagels, and donuts for about two and a half years, since just after the market started. Their bread sells out regularly. I made the mistake of walking around the market first to get a feel for it and when I got back to them, most of the loaves were gone. 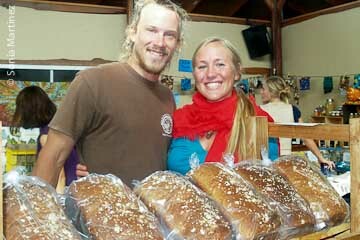 Matt and Noelle Purvis of the Tin Shack Bakery. Mat and Noelle say they love the people, love the product (mix). Matt stressed that SPACE is doing a lot for the community locally and beyond as an example of sustainability and community cooperation. He feels there are real relationships between the people and much interdependence which is a shining light in today’s world of disconnect and independence from neighbors. Love Family Foods' huevos rancheros. Scott Laaback and Rachael Monter serve a combination of breakfast and brunch to many people every Saturday morning. The name of their little food booth is Love Family Foods and they live and work at the Evening Rain Farm in the Kapoho area of Puna. The farm, although not certified organic, strives to practice organic methods and is hoping to achieve as much sustainability as possible. Both Scott and Rachael have a background in forestry and quit jobs with the US Forest Service in Lake Tahoe to come to Hawaii to experience a more sustainable lifestyle. For the last two years they have been offering a variety of food inspired by locally available ingredients and their love of wholesome food. 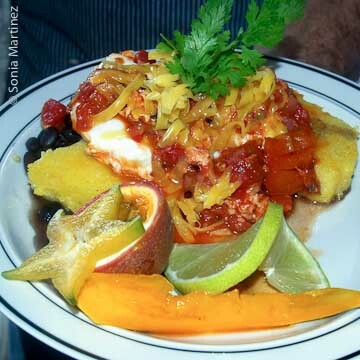 Although they feature 6 different items on their blackboard menu, the biggest hit lately seems to be Huevos Rancheros served with hot griddle polenta squares and drowned in a spicy sauce of chunky tomatoes, onions, herbs and hot peppers. Another favorite seems to be Rachael’s French toast made with Noelle Purvis’ Cinnamon Swirl bread and served with delicious spice orange compote. I opted for modified Huevos Rancheros, since the serving were a bit more than I could manage. All of their offerings are beautifully presented with slices of fresh fruit on the side of the plate. To go along with their friendly sustainability efforts, their food is served on real china plates and stainless flatware instead of disposable paper products. Normand Dufresne and Kelly King, aka Da Banana Boys, have had a booth at this market for the last two years. At an elevation of between 500 and 750 feet in Opihikao, where the soil is mostly covered in lava with a few pockets of soil, they’ve grown bananas, avocadoes, pineapples, noni, and papayas for nine years. Normand comments that apple bananas seem to be their best selling item. Other big sellers when they have any to offer are fresh liliko’i juice and dried banana chips. Kelly makes beautiful leis using locally scavenged materials and was working on fresh leis while I visited with them. I’ve known Normand and Kelly for many years and was very happy to be able to talk story with them for a little bit. Catrina Saragoza of the Koa'e Farmers Collective. Catarina Saragoza was manning a booth for the first time representing seven different growers under the banner of The Koa’e Farmers Collective. The offerings in this booth were mostly fruit, but Catarina hopes that as more farmers rally under the Koa’e Farmers Collective, the selection will include a bigger variety not only of fruit but also vegetables and other spices. At this time there were baskets and boxes of ‘ulu (breadfruit), tangerines, oranges, limes, pomelo, Meyer lemons, rollinia, liliko’i, locally grown vanilla beans and small bags of allspice. I don’t think I could say anything better than that! Location: Seaview Performing Art Center for Education. 12-247 Pohakupele Loop in Seaview Estates, Puna. Market Manager: Kelly Nafie, 965-8756.
a. Number of vendors: Average 35 per week (started with 5 vendors three years ago!). b. Diversity of products: Has increased with number of vendors, but we're still ALL LOCAL – it has to be grown and/or made on this island, no exceptions. c. Increase in income: Income has increased (bringing in roughly 7 times what we were from booth fees three years ago) – this just came along with the increase in numbers of vendors. Geographical range of vendors: Primarily Puna, though we've had a few in from HPP and Hilo, occasionally from Kona as well. a. Range of products: Veggies, fruits, herbs, spirulina, cheeses, yogurt, eggs, honey, fresh fish; handmade jewelry, clothing, cards, paintings, photographs; fresh smoothies and juices, organic breakfasts (eggs, pancakes, omelettes, chili, biscuits and gravy, bagels); raw pies and chocolates; cookies, cakes, coffee, espresso and more! b. Best selling products: Unsure – we don't track our vendor sales. Other special features: We used to have market entertainment, but we're in the midst of getting our special use permit amended now so we're unable to have live entertainment at the moment. We're hoping to be able to offer this again after the new permit goes through. We put some great tunes over the sound system though (Latin and African rhythms mostly right now). As of September 2010, we now take EBT!!! 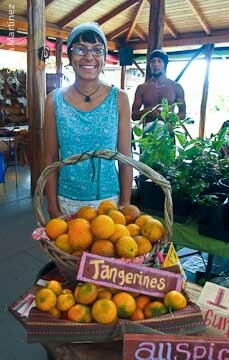 We're the second farmers market on this island to do so (Hilo is the only other market on the island taking EBT). We're extremely excited about this! Not only is it great for community members who have EBT/SNAP benefits – it is also proving wonderful for our small farmers and other EBT-eligible food vendors. Vendors who are selling foods that are EBT-eligible are reporting an increase of 10-40% in their income in just the past month and a half!